My computer has been broken for a while now and blogging without it is not easy. Hopefully it'll be fixed soon and I'll be able to share my cards and other projects with you more often. 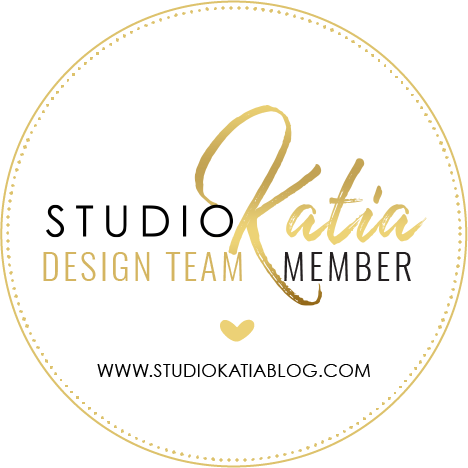 Today I have a card I made as a designer for new DDCC Challenge - Inspiration. Our sponsor for this week is fabulous Crafty Sentiments with 3 digis for a lucky winner. У мене поламався мій компутер і з його відсутністю дуже важко вести блог. Буду сподіватися, що скоро мені його полагодять і зможу частіше дописувати й показувати вам свої роботи. Сьогодні маю вам показати таку просту листівку, яку робила як дизайнер блогу DDCC на їхнє нове завдання Фотонатхнення. 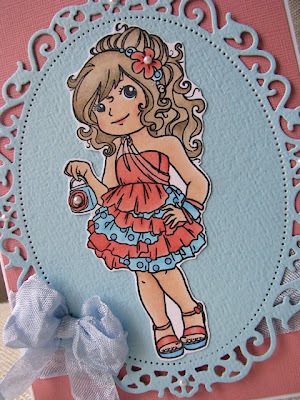 For my card I used Annabel Party Girl rubber stamp. I coloured it with copic markers. I used Bazzill Basics Paper, half pearls and ribbon from 3JAM Girls. I also used Spellbinders Floral Ovals. Для листівки я використала ґумовий штамп Annabel Party Girl від Crafty Sentiments. Розмалювала я його маркерами копік. Для тла та рамочки використала папір від Bazzill Basics Paper, додала півперлини та стрічку. Рамочку вирізала за допомогою ножа від Spellbinders Floral Ovals. Дякую, що зазирнули! Бажаю вам гарного дня! Very pretty love the image. Thank you for playing along this week at OSAAT. I sure hope to see you back again very soon. Good Luck in the challenge!!! 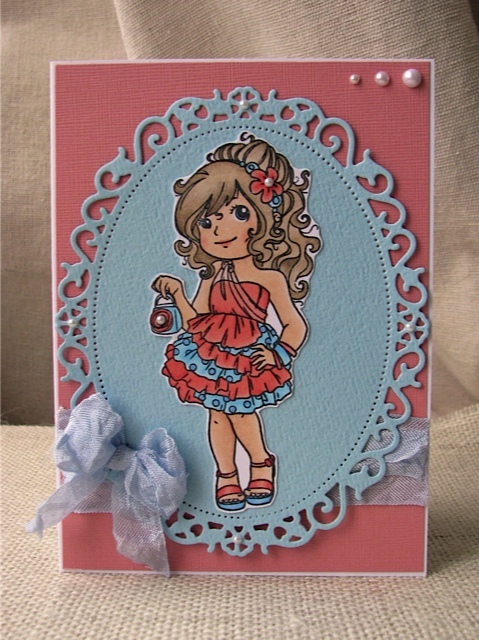 What a pretty card and the image is adorable, fab design! Lovely card!Very beautiful soft colours. Thanks for joining us at Card Mania Challenges. Good luck and hope you'll join us again. Very beautiful with all of your sweet pearl accents. Thanks for joining our pastel challenge at One Stop Craft Challenge.